Another Huge Grand Fantasia Wikia Update! The Grand Fantasia Wikia recieved a huge update today; A total of 3,718 pages were added containing information about many monsters found within the game. The Aggression type of the Monster - this is displayed in the Infobox colour name, as well as included in the categories. (In the case of duplicate monsters existing with the same name and multiple aggression types, the aggression type has been taken from the most aggressive monster in that list. i.e Red takes priority over Yellow, etc. A Picture of each Monster - These are all in high quality .PNG, I managed to link each individual monster ID to their model ID and took a screenshot of each model for the pages to reference. 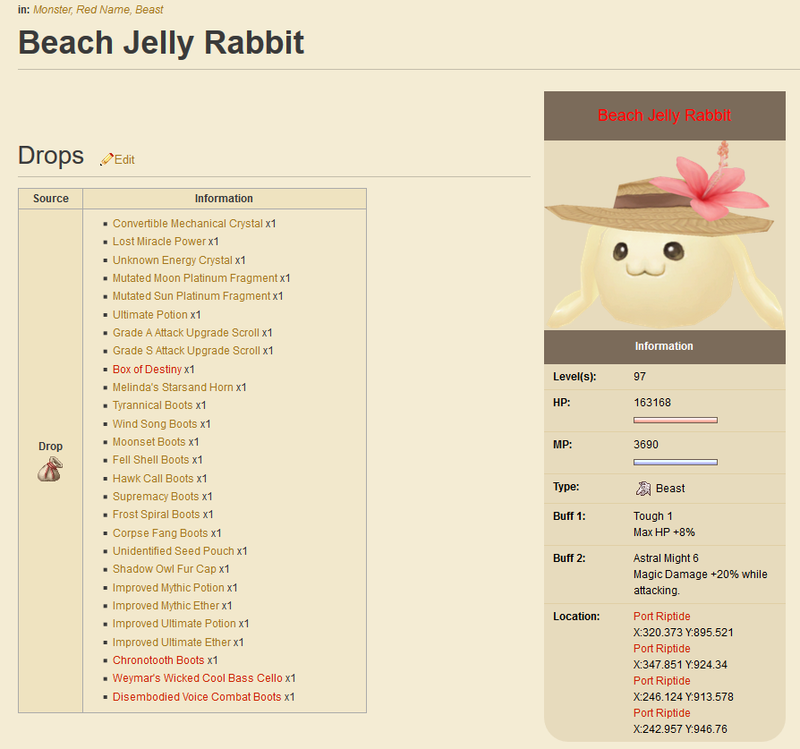 (Unfortunately, it was much easier to link each Monster ID to their models than it was their textures, meaning that monsters who exist in alternative colours to the 'default' colour such as a 'Pink Jelly Rabbit' will always be displayed in the default colour (For Jelly Rabbits this is Yellow) - this is not an easy thing to fix). The Level of the Monsters - Monsters with multiple levels have them separated by commas. The HP & MP of the Monster - A nice HP and MP bar graphic is displayed alongside these. The Type of the Monster - Whether a Monster is a Humanoid, Beast, Plant etc. with their corresponding icon. The Buffs of the Monster - Each Monster can have up to 2, this information is displayed within the Infobox. Location of the Monster - This is displayed in the Infobox, down to the exact co-ordinates - map names can also be clicked on to visit map pages (if they currently exist). The Drops of the Monster - This even includes item drops related to the new classes. Drops are displayed in a table on the left, with the amounts of the item that they drop. You can click on these items to be taken to a page about information on them. Monsters of varying levels and multiple drop tables will have them displayed one after the other. (As the wikia does not yet contain the information on the new class items, links belonging to those items will not work). Please let me know what you think and I hope this of use to you! Be sure to report/correct any missing information you may find. I'd like to eventually also add the skills belonging to each monster, but that may come in the future, followed by NPC information. I'd also like to thank Discord users [GS]Ryoko, [GS]Elksis, Beccachu and mew ♡ for some help with information gathering. Yay. Thanks for the hardwork. Glad I could give you a hand too. Not trying to be a pest or complain, but is there a page on wikia that shows blueprints the lvl we can use them at? like for example Lash out 4. i would like to know the lvls we can use the talents at. Yes, that would be the Talents page. This is incredible, thank you very much Dark. This'll make it significantly easier to check the drops of dungeon mobs also, something which was previously annoying to find. You're welcome - I hope to get some of the more recent/missing mobs in there too, as well as their skills. It'd be easier if I was able to automate a little more of it.